The onus was on the attorney for education groups suing the state: convince a skeptical Superior Court judge that the governor and Legislature violated voters’ will and the minimum school funding requirement under Proposition 98 by diverting billions in tax revenue from the General Fund last year. “There will be no such thing as a minimum guarantee if the state can manipulate it for political purposes,” attorney Deborah Caplan told San Francisco County Superior Court Judge Harold Kahn on Wednesday. Judge Kahn issued this one-paragraph preliminary ruling on Tuesday then entertained 90 minutes of testimony on Wednesday. Click to read. 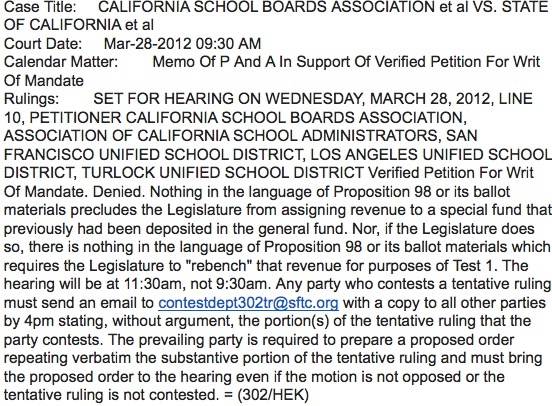 In a one-paragraph preliminary ruling the day before, Kahn wrote that nothing in the wording of Proposition 98 precluded the Legislature from shifting $5 billion in sales tax and vehicle license fee revenue to a separate account reimbursing counties for taking on some state responsibilities – even though the move shorted K-12 schools and community colleges about $2 billion. That would have been their share under Prop 98, had the $5 billion remained in the General Fund. But Kahn did give Caplan the bulk of a 90-minute hearing, extending through the lunch hour Wednesday, to make her case, and, notwithstanding his vigorous questioning, left open the possibility that she may have changed his mind. Kahn is expected to issue his final ruling within 30 days. 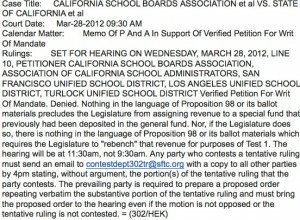 The case, brought by the California School Boards Association, Association of California School Administrators, and three school districts, has significant potential implications – immediate and long-term – for Prop 98, the initiative that voters passed in 1988 requiring that roughly 40 percent of the General Fund go toward schools and community colleges. With a victory, the governor and Legislature could create special funds at will to ignore voters’ stated priorities by reducing the General Fund and guarantee for schools. And Brown could use a win in this case to support his call for $5 billion in cuts to K-12 schools and community colleges if his proposed tax initiative fails in November. In that case, Brown is proposing a different manipulation: shifting $2.4 billion in school construction bond payments from the non-Prop 98 portion of the General Fund into Prop 98 – essentially a school funding cut. The plaintiffs don’t dispute the governor’s and Legislature’s ability to fund schools less than the constitutional guarantee. But Prop 98 requires a two-thirds vote to do so and prescribes how the money owed to schools will be paid back. * In this case, the Legislature simply ignored the constitutional obligation to suspend Prop 98 (Republicans, jamming Democrats, made it clear they wouldn’t vote for suspension). The plaintiffs also don’t deny that the governor and Legislature can shift money out of the General Fund or create special accounts. But ever since the passage of Prop 98, the Legislature has recalibrated the General Fund – “rebenching” in Prop 98 lingo – to make sure that Prop 98 wasn’t affected. This was the first time that reconfiguring wasn’t done, Caplan said. The state’s position, which Kahn adopted in his ruling, was that rebenching is not in the language of Prop 98 and was not mentioned in the initiative’s ballot literature. If the Legislature has adopted rebenching by statute, it can undo it by statute if it chooses. “Voters could have applied Proposition 98 to all revenues in the state, but they said only the General Fund,” Deputy State Attorney General Daniel Powell told the court. Shifting sales tax revenue to the counties for realignment of services was a valid purpose, not a manipulation, he said. But Caplan said what voters wanted was clear from the language of Prop 98 and the ballot arguments. Voters were promised that Prop 98 would take the politics out of financing decisions; the term minimum funding guarantee itself “is inconsistent with allowing the state to manipulate it at will.” Otherwise, there would be “no integrity” to the initiative, she said. Furthermore, the Legislature demonstrated that it understood Prop 98’s intent in adopting rebenching as implementation legislation soon after voters passed the initiative. “The state has rebenched many times over the years and honored the principle repeatedly, sometimes to the state’s benefit,” Caplan said, but also to protect education funding levels. Abe Hajela, an attorney with School Innovations & Advocacy who has been part of the plantiffs’ team, told me that it is unreasonable to expect voters to anticipate all efforts to undermine an initiative, then write them into the Constitution. That’s the purpose of implementation legislation. The sales tax diversion was part of a deal that Brown cut with the California Teachers Association to pass the budget last year. But the statutory wording reflected CTA’s and legislators’ ambivalence. It said that passage of a tax initiative by November 2012 would make the sales tax shift to counties permanent but that schools would be made whole with the additional revenue. If the initiative failed, schools would be paid back what was diverted over four years. But that was then. Brown is now reneging on that promise and is proposing to cut K-12 and community colleges further if the tax proposal fails. That’s all the more reason, the ed groups argue, that the constitutional guarantee must be protected. * Update: It would be more accurate for me to say that the law prescribes how funding levels will eventually be restored if the Legislature suspends Prop 98. The dollars lost in a suspended year are not paid back. For the Legislative Analyst’s Prop 98 primer explaining this, go here.